In 1978 at the age of 47 she announced her retirement – it would last 35 years until her death in January 2014 in Kolkata, where she lived the life of a recluse. She was 82. Suchitra Sen was one of India’s best-known movie actresses, who reigned supreme for 26 years during Bengal’s cinematic golden age. Beautiful, glamorous, and mysterious, Suchitra Sen was adulated and envied for living life on her terms. She turned down film offers by the two cinematic giants – Satyajit Ray and Raj Kapoor. She was beyond reach. Her film career spanned more than 50 Bengali films and seven Hindi films. She and Uttam Kumar were the most successful romantic pair in the history of Bengali cinema – having done 30 films together, with hits such as “Agni Pariksha” (1954) and “Saptapadi” (1961). Her first Hindi film was Bimal Roy’s “Devdas” (1955), a major box-office success. 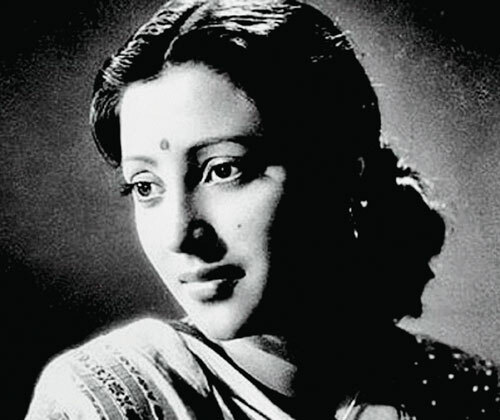 Suchitra Sen was born Roma Dasgupta on April 6, 1931, in Pabna, now in Bangladesh. The fifth child of Karunamoy Dasgupta, a school headmaster, and Indira Dasgupta, a homemaker, she was more interested in singing. Hailing from a conservative, middle class Bengali family, it would have been inconceivable for Roma to nurture her inborn talents in acting and singing or to aspire for a career in the field of entertainment. Young Roma was perhaps not even aware of her talent until she got married to Dibanath Sen in 1947 at the age of sixteen. Wedded to a stylish and city bred engineer, Roma soon found herself in the midst of the city’s fashionable circuit. Her doting father-in-law Adinath, and her husband Dibanath groomed her style and poise. The small town girl readily shed off her inhibitions and blended in with the upper crust.